Here is a good bargain. Lenovo is one of the world's top PC manufacturers. It also have in its line up, tablets. 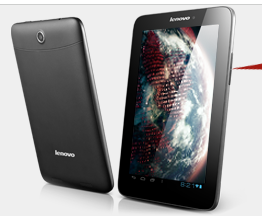 There is a good deal for Lenovo IdeaTab over at CNET you may want to check out. The deals is for Lenovo IdeaTab A2107 7-inch, 8GB and 16GB, both are now priced below $200. A very sweet new year deal. This tablet features an MTK6575 1GHz processor, 7" 1024x600 touchscreen LCD, 1GB RAM, 8GB internal storage, 802.11n wireless, Bluetooth 4.0, microSD card slot, 2-megapixel rear-facing camera, 0.3-megapixel front-facing camera, 1-cell battery, and Google Android 4.0 (Ice Cream sandwich). Hurry and go check out the deal over at CNET link here. This deal will not last forever.